This week the new Expose Skate Mag came out. I just started working for them making the artist Profiles and the first artist I interviewed was my friend Labrona. I made his a nice 2 page layout with his nice art. In that issue you will also find an ad of my clothing brand Positive Creations with Barry Walsh repping it solid. So go n get yourself a copy! Now!! This afternoon I got interviewed for an amazing documentary about skateboard Art called Sk8 Face. Since the produce live sin Venice Beach, California we did it over skype with my local film crew (Pablo Pictures). Im so stoked cause I will be talking alongside skate giants like Gonz, Steve Olson, Lance Mountain, Tony Hawk, Tommy Guerrero, etc. and artists like Jim Phillips(Santa Cruz), VC Johnson(Powell Peralta), Shepard Fairey, Andy Howell, Wes Humpston and many more. Movie is coming out next spring. I'm so stocked!! 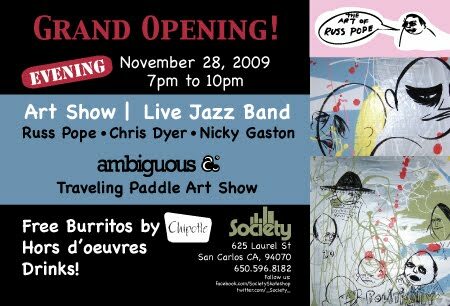 This coming November 28 I will be showing some original skate art paintings at the grand opening of Society Skateshop in San Carlos, California. Check it out if youre in the area! I attended an Alex Grey Exhibition in Toronto last spring and was interviewed by this web tv show "Art Star". I'm only in it for 2 seconds talking about nothing (thank you editors..) but it's always nice to be in a video with Alex. 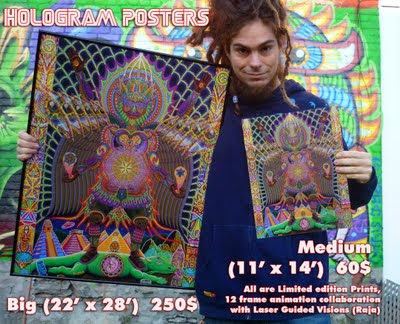 I just recieved my new Hologram Posters!! Now I have 2 different sizes and prices. I have Medium (11 x 14') for 60$ and Big (22 x 28') for 250$ (framed). 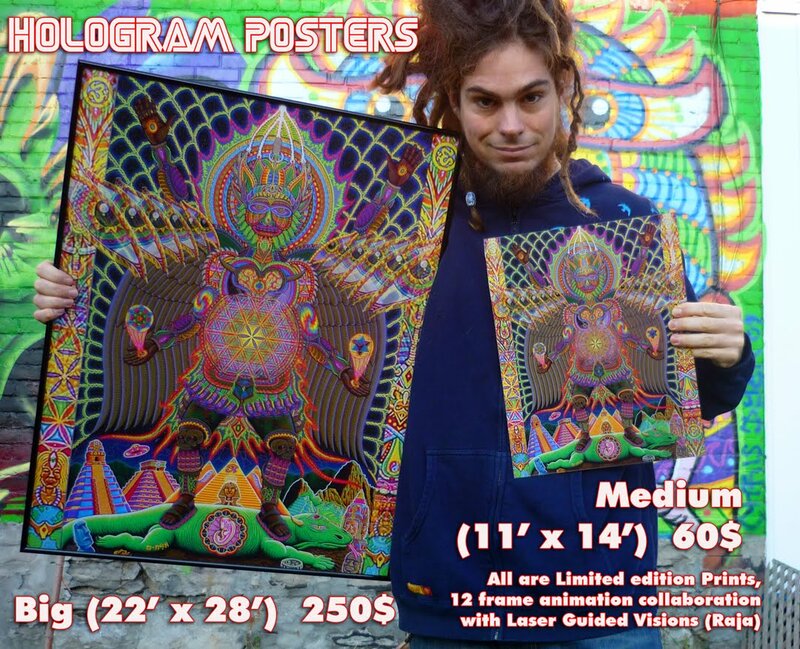 They are sick 12 frame animations I collaborated with Raja (Laser Guided Visions) from Seattle. Preview of teh movement ina post below. If you'd like to order one of these limited edition gems, hit me an email (el.flyer@gmail.com) . 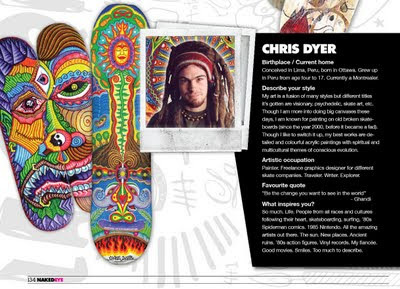 This month there is a nice 3 page article in Naked Eye Magazine about La Paria, the skate art crew from Montreal I am part of. There is many members in the group but they only chose 5. At the bottom is the close up of my mini interview. Enjoy.